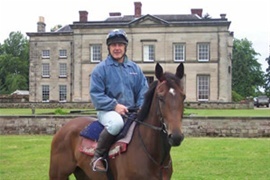 John and Mary Mackie have successfully trained at Barton Hall Stables near Church Broughton, South Derbyshire for nearly 30 years, having started their training career in Malton. John rode as an Amateur jockey for Ken Oliver in the late 70s before moving on to be Ian Balding’s assistant trainer at Kingsclere in the early 80s. Mary also rode as an Amateur jockey and was crowned Northern Point to Point champion before breaking her back in a fall at Bogside. She is a very accomplished horsewoman who has a key role as both work rider and with the yard administration. Son James and daughter Joanna also help out riding work and schooling horses as well as assisting at the races. Barton Hall Stables are ideally situated in the centre of the country between Derby and Uttoxeter, making access to most racecourses both easy and economical. It also provides the perfect environment to train horses as they are surrounded by the country estate of Barton Blount, including 40 acres of post and railed paddocks and a further 120 acres of parkland. A six furlong all-weather gallop is situated a few hundred yards from stables and its stiff uphill finish makes it ideal for training both jumpers and flat horses. John’s philosophy has always been to purchase good value horses with a view to giving their owners some fun. Although he has yet to attract the spending power of some of the bigger yards he prides himself on the fact that he has bought numerous modestly priced horses that have gone on to win races and compete at a higher level than their purchase price might have suggested. To date JOHN MACKIE RACING has trained a total of 41 winners for Derbyshire Racing, with Arizona John leading the way with 8 wins, from Custard the Dragon with 7 wins, Available 6 wins, Illustrious Forest 5 wins, Vanilla Rum 3 wins, All Three Fables 2 wins, Inflexiball 2 wins, Aegean Destiny 2 wins, Choristar 2 wins, Keep Calm 1 win, Innish Man 1 win, Impeccability 1 win, and Pagan Rules with 1 win - a fantastic record!